In March 2010, Clyde Wolpe began writing a series of articles for Gammon Village and named them the "Positive Backgammon" series. Grant Hoffman enjoyed the articles and found that some of the concepts worked very well for him, particularly in the fast pace of a chouette where quick decisions were required. Clyde and Grant began corresponding and exchanging ideas, which eventually led to them collaborating to write this book. COVER: In the age of bots and robotic learning, this book is a breath of fresh air, focusing on powerful principles that guide you through the complications of any position and quickly lead you to the correct move. Priority thinking is the key to finding the solution and everythink else flows from that. This book tackles situations with a unique approach and provides a sound structure for quick and accurate problem solving. Gone are the days of "scanning" every position until you stumble upon the answer; using the direct methods revealed here, you will consistently and quickly find the correct play. 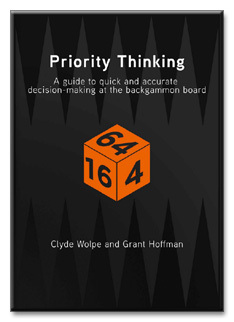 AUTHORS: Clyde Wolpe and Grant Hoffman are both backgammon players. This book is based on a series of articles that they were commissioned to do for Gammon Village, and the decision to publish was made after receiving much positive feedback from readers and pupils who endorsed their approach. Clyde Wolpe has been South African Champion at both Backgammon and Chess. He is a FIDE Chess Instructor and an expert Backgammon coach. Clide is also the co-author of The Beginner's Chess Companion. Grant Hoffman is actively involved in playing, teaching, and promoting backgammon in New Zealand. He has won the NZ Backgammon Championship twice and was a finalist in the Australian Open 2008. He regularly has backgammon articles published.